COK is very pleased to announce that the unfounded charge against COK’s courageous investigator Taylor Radig has been dropped! The video footage showing hideous abuse of newborn calves that Taylor provided to authorities also led to criminal animal cruelty charges against three people who were caught by COK’s camera abusing these very young and fragile animals. It’s our understanding that those charges are still pending and the defendants go to court on Tues., Jan 21 for their arraignment. Please help us keep our undercover cameras rolling. In 2013, a COK undercover investigator worked inside Quanah Cattle Co. (QCC), an animal agribusiness company in Kersey, Colorado that purchases newborn calves from surrounding dairy factories and temporarily confines them before shipping them out to be raised for their meat. Just days old, many of these calves – some of whom still have their umbilical cords hanging from their bodies – are too feeble or frightened to walk steadily. As our footage shows, in the process of being moved on and off trucks, these fragile animals are violently dragged by their legs, pulled by their ears, lifted by their tails, kicked, thrown, slammed, and flipped. The cruelty to calves uncovered in this investigation was so shocking and violent that COK turned evidence over to local authorities, and we are now working with them on this case. The Dairy Industry: Most of the dairy calves purchased by QCC are male – they’re considered unwanted industry byproducts since they’re unable to produce milk. After being trucked in and unloaded at QCC, they’ll be confined in crates or hutches for around a week and then loaded back on trucks to be shipped out, sold, and raised for their meat. 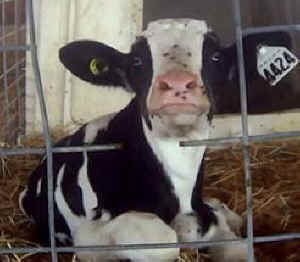 Marketed as veal or beef, depending on their age when slaughtered, these young animals are the often forgotten victims of the dairy industry.